Nigg Energy Park boasts one of the finest dry docks of its kind in Europe, capable of accommodating semi-submersible and jack-up rigs, shipping (including FPSOs) to carry out major repair, maintenance, enhancement and conversion projects. The site is an ideal location for major IRM with sheltered deep water access allowing for 24/7 operations and supported by a range of in-house services and facilities, including on-site accommodation, client project offices, mobile and crawler cranes and SPMT’s. Also an ideal base for pre-assembly, storage and handling of large scale equipment for oil and gas and offshore renewables projects, our site provides flexibility in delivery options. Nigg’s fabrication facilities are amongst the largest of their type in Europe, offering in excess of 36,000 sq m of covered workspace. Chart Datum is 2.1 meters below ordnance datum Newlyn. Mean low water springs is 0.6 meters above chart datum. Mean high water springs is 4.3 meters above chart datum. Spring tide range is 3.7 meters. 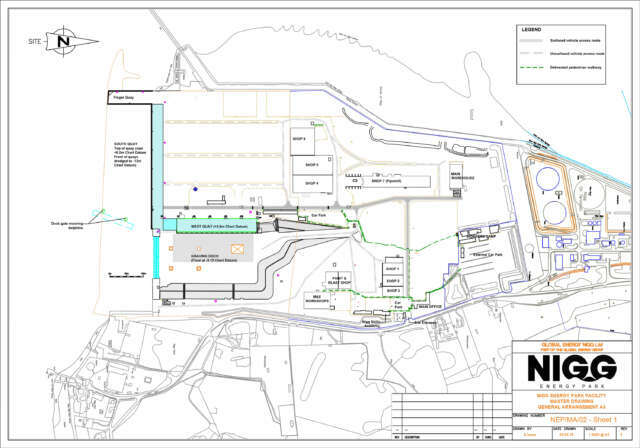 Since acquiring the former fabrication yard in October 2011, Global Energy Group has made significant investment in the facility including upgrades to external and internal infrastructure, as well as entirely re-facing the existing south quay with a new steel piled wall and the introduction of a new finger quay which extends some 130m into the Firth. The upgraded quayside is served with electricity, potable water, sea water fire-fighting hydrants and tower lighting. Future developments include the installation of fixed pipe fuel bunkering systems and additional upgrades to the onsite facilities. Nigg Energy Park continue to support the offshore oil and gas sector with IRM services for rigs, FPSO’s and subsea construction vessels, as well as growing its reputation as the preferred port of choice for subsea vessels and DSV’s for mob/demob activities. The Group continues to develop its renewables sector fabrication and logistics offerings for both wind and tidal projects, and will commence marshalling activities for the Beatrice offshore wind project in 2018. 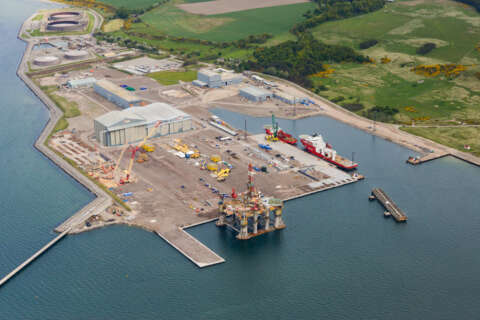 With over 900m of high ground loading capacity quayside available, Nigg Energy Park caters for the largest vessels in operation today, providing flexibility of use to our clients, with our 232,000 sq m of available/potential lay down/storage.